Here are iOS 11.1 beta 2 changes, release notes and changelog in full that you can check out from Apple for your iPhone, iPad and iPod touch device. It should be common knowledge by now that Apple has released iOS 11.1 beta 2 to users registered with the Apple Developer Program. 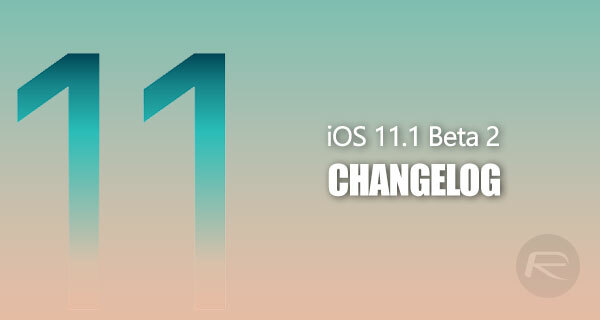 The release by Apple’s internal engineers means that those lucky and hard-working developers will be getting notified about the availability of the iOS 11.1 beta update, putting them perfectly placed to go through the install process and getting it on whatever hardware they have. In addition to presenting the opportunity for developers to see if the latest release of iOS 11.1 is deemed to be stable on their devices, it’s also an opportunity for them to test their own software for compatibility, as well as dive into the new build and see exactly what Apple has changed or fixed since the initial seed was pushed out to developers two weeks ago. Finding out exactly what has changed from the previous iOS 11.1 beta release, as well as stringently putting it through its paces to actually find out what is still wrong with it, will give developers the opportunity to provide some meaningful feedback to Apple. The release of iOS 11.1 isn’t just about developers getting it onto their devices for the opportunity to play and interact with it. It’s also an immediate opportunity for us all to see the official changelog – or releases notes if you prefer – assigned against the release as written internally by Apple. These release notes – or changelog as some prefer to call them – generally give an exhaustive overview of exactly what has changed with this release as well as highlight areas which are still broken, which require additional work, or which Apple is known to have actually caused to break as part of this release. The release notes are essentially an opportunity for Apple to give full transparency on the release. One thing that we do know will be different is the fact that this particular version has full access to a whopping new range of emoji characters which device owners can choose to use in an array of messaging apps and services. We also know that beta 2 of iOS 11.1 will contain fixes and bug improvements as part of the process to better the platform. As always, check out the official release notes below to see exactly what has changed from Apple’s perspective. Update x1: iOS 11.1 beta 2 also brings back 3D Touch App Switcher gesture!